Dedicating Seforim and books is a meaningful way to memorialize a departed loved one. 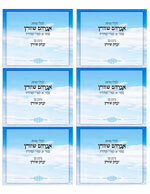 It is particularly valuable since the person gains the ultimate merit of Torah study each time the Sefer is used. 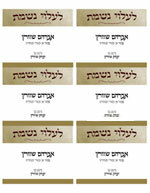 Use the templates below to make your own tribute labels and place them in each Sefer or book that you donate. The templates below are compatible with Avery Label 5164 (4" x3.3"), which are available at your local office supply store. These are Microsoft Word templates, so you will need the Microsoft Word application on your computer in order to use these. For the templates that include Hebrew text, you will need at least one Hebrew font on your computer, as well. 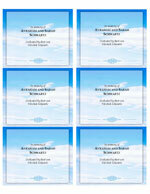 Simply click on one of the files below, personalize the label, and print. Another option is to print your labels with a professional label printing company. LabelsByTheSheet Printing Co. allows you to custom print as few as 25 professional glossy labels starting at about $.80 each. The 4" x 3" label templates below (in Microsoft Word format) are designed for printing by LabelsByTheSheet and are a perfect size for most book dedications. After customizing one of the label templates below, save it as a PDF (if you don't know how to do this, just ask a friend or family member for help), and then contact LabelsByTheSheet at 877-668-0130, artwork@labelsbythesheet.com or www.labelsbythesheet.com.